B) this band must be amazing. I cannot speak to the veracity of the “End of Noir” tweeting, hopefully there is no merit to the hiatus, but I can tell you that, yes, the answer to the above question is C) This Band Is Amazing. Magic Arm is Marc Rigelsford of Manchester, England, a very Noirian individualistic constructor of sound, a tinkerer of rhythm and harmony. Rigelsford plays all of the instruments, recording and mixing early albums in his bedroom. The power of modern computing has rewarded mankind with its liberation from a thousand-year-old establishment – a rigid oligarchy that expects lines to be queued, boxes to be filled, and protocol to be staunchly obeyed – and the fiery forges confined within suburban bedrooms now craft goods of higher quality than that of the monolithic industrial pop automaton. High caliber musicians now have the ability to self-produce and publish. Like Noir, Magic Arm has released a large portion of his music to the internet. After touring throughout Europe in support of Camera Obscura, Rigelsford returned to his home where he recorded Images Rolling, his second full length album, to be released June 3rd of this year. 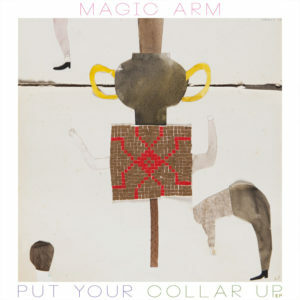 The Put Your Collar Up EP features the first single from the upcoming album.